We are still working to place rocks along the new Sagebrush Trail’s downhill edge. Why the rocks? Most people think we do it to make the trail look good but the soil on the north side of Badger Mountain is made of very fine particles, mostly wind deposits. That’s right, it is piled up dust and is very weak. We need to support the downhill edge of the trail or it will sluff off narrowing the trail and making it less safe. The rocks also help keep the gravel from working off the trail and down the hill and they clearly mark the edge of the trail. We have now have about 960 feet of rocks installed along the edge. We are coming up by the water tanks and the rocks are easier to install because the slope is not as steep. Last week we only had 6 volunteers averaging two a day. We have been getting lots of complements on how great the trails are but it takes volunteers to keep them that way. We could use some more help! We only have about a month left before the ground freezes and there is still other maintenance work that needs to be done. 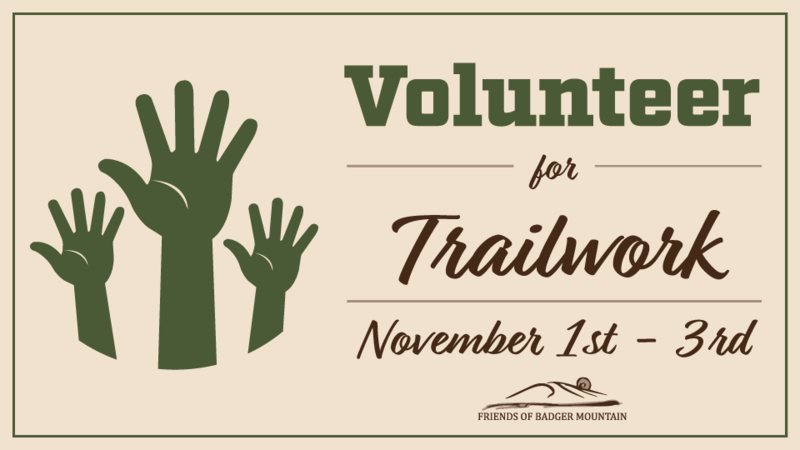 When you volunteer you will need to bring work gloves, snacks and water, and dress for the weather. I will provide all the tools. Also we will be working next to the ground so maybe a gardening pad? The rocks may look big but we do not lift them, we roll them into place. There isn’t any work for preteens and younger.